Recently I de-converted from Christianity. I was attending a "born-again" Christian church called Jesus Is Lord Church. I was part of music team, and the guitarist. I can honestly say that even though I didn't speak-in-tongues(now I call it gibberish) I was a born-again. I had another talent that I was nourishing, it was debating. I read a book besides the Bible, it was "Witnessing to the Cults" or something like that. I was hard-core about the basics of religions, I know all the flaws of all Christian cults such as: Iglesia ni Christo, Jehovah's Witness, Mormonism, and sometimes Catholic Church itself. But one thing I refused to see was the born-again church itself. Next is I studied the atheism and watched debates about them. I am convinced that God is therefore true. The thing that started my doubt was an other-branch-church-pastor visited us and preached about who gets glorified in heaven, is it the inside-church workers or the ones who "brought" fresh souls to the church? I was hurt from the inside when he said that it's not the great/good guitarist, drummer, singer, and the others who worked hard to make the Sunday service possible is the one who gets an award in heaven but it is the one who "brought" souls to the church. I was a giving my tithes for the reason that even though I don't have the other "talking" talent (if you know what I mean), I can still contribute on other's salvation. Didn't he know that our own local pastor taught that "every thing that you do for Christ is not in vain?" I'm starting to feel something is not right. Then I reviewed the Christian-vs-Atheist debates namely: Dinesh D'Souza vs Christopher Hitchens, William Lane Craig vs Christopher Hitchens, and others. Now I was truly listening on both sides and became open-minded. Hitchens' points out about "the Problem of Evil" and Craig's "if God does not exist" arguments. At first I was confused the compatibility of those two points. I Googled about "God evil" key words. That's is the time when I found out about misotheism. It's basics was hatred on God/gods. It isn't as popular as atheism but it makes a lot of sense for me than believing that there is no God. It's not a joke that a person burns in hell forever, tormented day and night because of finite crime.The arguments were about whether God is incompetent on being a god or He is a malevolent, trickster god. These things made a lot sense to me. The atheist argues about the contradictions and errancy of the Bible and they weren't wrong about that. But what about the argument "you can't get something about nothing," it is logical to think that nothing stays nothing forever and something must be existed beyond time in order to create something bound by time. Moreover Christians sometimes says that God is not a god of confusion, they were wrong. If God is not a god of confusion, why there are Christian denominations even though Jesus Himself prayed to the Father that Christians must unite so that the world will know that He and the Father is One. Their (a Christian denomination) answer is just "they are cult" even though they are use the same version. 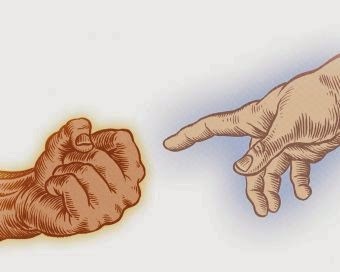 If you defeat God about righteousness, He argue about how He created and controls the Universe and how pathetic you're abilities and knowledge (Book of Job). Of course Job will submit to this bully God. The Christians sometimes says that God knows everything about me, is that I'm an "open book" in Him. Ha. If God is all-knowing, then why put the tree of good and evil in the first place KNOWING that Adam and Eve will fall on the snake's deception? Our local pastor taught that "Pride of Life" is the reason why they ate the fruit but she was wrong. It was CURIOSITY that made them eat. It was lack of knowledge. What kind of a father gives his son a loaded pistol, cocked and locked KNOWING that his son may shoot and even kill himself and does nothing, hoping that he will learn something on his mistakes? Is it sane to do get hurt (psychologically, physically, and spiritually) first learn later? Maybe (for the reason that I'm not sure) Einstein is right when he believed that God is not a personal god, that He didn't reveal Himself to humanity in anyway. But I cannot believe this God. The Christians often say "how can you look at the clear night sky and say there is no God." My answer is this: "how can you look throughout history, from Abraham to this present day mankind's suffering (on war, famine, and terrorism) because of different beliefs, and not say it's God's fault." It's not a joke that a person burns in hell forever, tormented day and night because of finite crime. My brother (who is a Christian) might answer me that it's not the guilty who says what punishment he must endure but it is the judge. I will say "it is not healthy to 'play who believes and who goes to hell.' Only a sick Person does that." What will happen to those people who never heard in anyway the "good news" and died? The biblical answer is they get toasted. According to Apostle Paul and Craig himself they will be judged on the information they had that time and how they responded to it. All I can say: "how convenient." The people who was born in Iran is more likely be Moslem, who are they going to reflect their spiritual life? It is reasonable to think that children will most be likely to imitate their parents than "unusual" guys. In conclusion, God is nothing more than a magician, illusionist, and a trickster. Manipulating you to do stupid stuffs, enslaving you to eternal slavery or torment. I'm going to quote about the Joker's famous words: "...schemers are trying to control their little world, and I show them how pathetic they really are...," and "...when the chips are down, these 'civilized' people they'll eat each other..." No wonder people are made with the image of God. God and the devil are both schemers (that is, planning to sabotage and control mankind) I conclude. Just remember, the devil never work without approval from Daddy because God is in control, right?